Summer is slowly coming to the end and we are starting to see the presence of fall in Sho-Fu-En. The feathery, silver flowerheads of maidenhair grass (Miscanthus sinensis ‘Yakushima’) wave in the breeze around the Japanese Garden’s moon-viewing deck. There is a feeling of peacefulness and serenity in the Japanese Garden which compels many visitors to linger. The therapeutic effect of Japanese garden envelopment has become a fascinating and exciting topic among garden professionals. 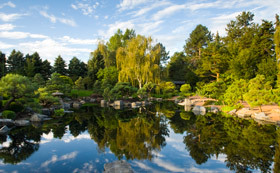 Thursday, Oct. 3, 2013, in conjunction with the Japan-America Society of Colorado, Denver Botanic Gardens is hosting "Beyond the Beauty," a program highlighting Japanese Gardens role in horticultural therapy. The keynote presentation will be given by Dr. Eijiro Fujii from Chiba University in Japan. Dr. Fujii will present “Japanese Gardens and the Therapeutic Possibility” which explores the relationship of neurological function with Japanese gardening. In addition to Dr. Fujii’s presentation, Denver Botanic Gardens’ Senior Horticulturist Angie Foster and Bonsai Specialist Larry Jackel will present “Using Bonsai Design in Horticultural Therapy.” They co-manage a Bonsai therapy program for cancer patients and survivors from Rocky Mountain Cancer Centers. The program also includes tours of Shofu-En by Ebi Kondo, curator of the Japanese Garden, at 9 a.m. and 12:30 p.m. The program will be a perfect opportunity to enjoy a beautiful autumn day in Shofu-En, and to be inspired by new connections between gardening, therapy and neuroscience. ‹ Previous Article: DRACULA at large at Denver Botanic Gardens!